Wow – $14K for the reintroduced base 1.2 Pop. AWOL since 2009, last time it cost $10K more. So, what’s happened? 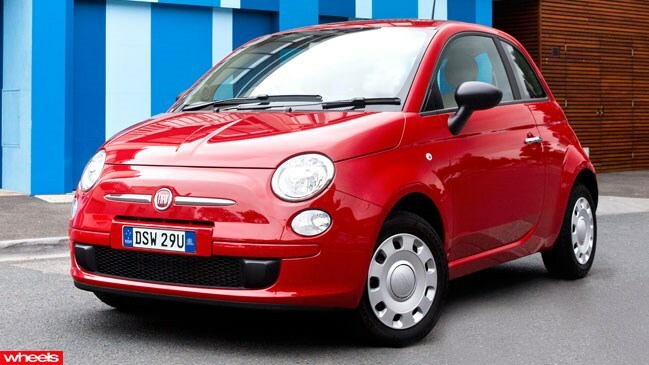 Now in charge of importing its own wares to Oz, Fiat is determined to flick the fringe for mainstream, so it’s plonked the entry 500 against the Volkswagen Up and Holden Barina Spark down in the new-car bargain-basement arena. So how does the versatile 1.2 Pop cut it in the new-car creche? Looking super sassy in off-white Bakelite-like trim, contrasting with glossy body-coloured dash bits, the alluring cabin artfully melds old-school elegance with modern functionality. It just feels vintage. Today’s supermini amenities – seven airbags, air-con, CD/MP3/USB audio, Bluetooth telephony, power windows, telescopic wheel with remote controls for media and trip-computer activation – are all present and easily accessible. While the 500 features only four seats and limited cargo capacity within its dinky derriere, there’s more interior space than the 3.5-metre length suggests – although choosing the optional sunroof does hinder headroom. Which may be problematic, since the seats are set too high. Furthermore, fat windscreen pillars can magically make whole cars vanish when negotiating roundabouts; the ‘glovebox’ is just a tray beneath a tilting front passenger-seat cushion; the rear backrest isn’t split; and missing overhead grab handles is a Euro austerity measure too far. But seeing as the Fiat’s mass is a laughable 865kg, the ancient 51kW/102Nm 1.2-litre four-cylinder single-cam ‘Fire’ four-cylinder engine is more of a slogger than a slug, thanks to handy low-down torque and suitable gear ratios. Together with a smooth five-speed manual shifter, they make the 500 feel feistier than the feeble figures suggest, and even maintain the pace at freeway speeds. Unfortunately, the Fiat’s electric steering isn’t kart-like, but the numb helm is at least reactive, and offers a super-light dumb mode for effort-free, round-town twirling. Similarly, riding on 175/65R14 rubber, the Pop’s front-drive chassis provides some degree of cushy pliancy and composure, but the 500 lacks the alacrity and poise of the accomplished Up. Still, nothing for $14K is as enchanting inside or out. Oozing propriety and charm, the 1.2 Pop feels truest to the 1957-’75 Nuova Cinquecento original in concept and execution.